This fragrance-free gel acts as an anti-pollution system which may help to protect the skin from external and internal stressors which could compromise skin health and wellbeing. It is enriched with vitamins and a variety of powerful antioxidants, including Beta-Carotene the plant form of vitamin A, vitamin C and vitamin E. It leaves the skin feeling protected and looking healthier. Contains a high concentration of antioxidants that are proven to combat the effects of free radical damage. Has a cooling and moisturising effect on problem and sensitive skin types. Apply Antioxidant Gel evenly to the face, neck and décolleté or any focus area of sensitivity before moisturising with your regular vitamin A enriched Environ moisturiser. Please note: Antioxidant Gel may be introduced during any stage of the Vitamin STEP-UP SYSTEM™ or it may be used as a primary moisturiser if the skin is sensitive to other forms of vitamin A, for example Retinyl Propionate. 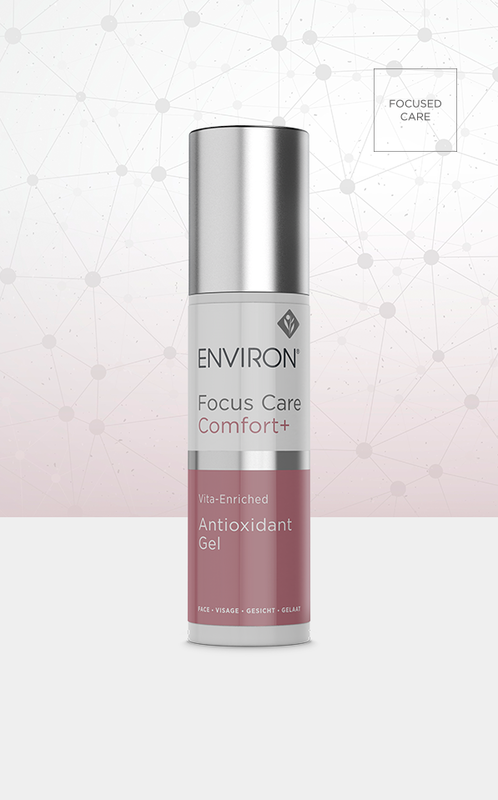 Environ recommends: Antioxidant Gel may be introduced during any stage of the Vitamin STEP-UP SYSTEM™ or it may be used as a primary moisturiser if the skin is sensitive to other forms of vitamin A, for example Retinyl Propionate. Consumers with very reactive skin should combine Antioxidant Gel with Colostrum Gel as a daily defence system to help improve the appearance of irritated and sensitive skin. This immune-boosting serum may help to protect sensitive skin from external and internal stressors resulting in skin that feels soft and soothed and looks restored.